Setting aside a small amount of food for long term storage every week can add up to a lot extra food over the course of a year. This is a guide about buying food for two years with $5 a week. Set aside $5 a week to buy the specific items each week. You will have a kitty set aside that you put the $5 in and you can't touch it for any reason but to buy the food storage item for that week. Put in the remaining change back into the kitty. Some things in the beginning are going to be cheap and then later will be more expensive. In order to pay for the expensive stuff later you need to keep the leftover money in the kitty. Weeks 38 and 44 you will have "off" to replenish the kitty. They suggest adding 6 lbs of dried yeast and 6 lbs of shortening and this should be enough to sustain 2 people for a year. For every 2 people you have in your family add $5 more and double or triple the amount of whatever you are buying that week. In any case it is always good to have food stores for lean times or emergencies. You may want to change what you buy but it's a good guide. I think it is a wise person who stocks up for an emergency. It may only be a matter of time before some of us experience some type of catastrophe and will be grateful to have some basic food to eat. Although they don't want to scare people, the emergency management people on a federal and state level are working on plans to deal with various types of disasters we may encounter in the future. In our state we deal with tornadoes and floods and there is a very strong possibility that we could have another earthquake along the New Madrid fault! If that happens we could have broken water lines, electrical lines, gas lines and a whole host of other problems. I'm not a worry wart or a doomsayer but I'm glad I have a well stocked pantry that could feed us for quite some time, should the need arise. I have a few tweaks to this plan. Rather than buying so much flour, get 1/2 cornmeal and 1/2 flour - makes same amount, but you get 2 different meals. 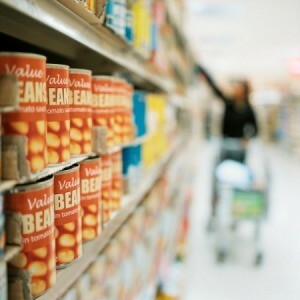 Also, rather than buying all tuna, watch for sales and get canned beef stew. Store rice as well as flour in freezer. Also, instant grits will store easily, come in flavors, and are very simple to make -- Plain goes with tuna too, I mix them together for breakfast or quick dinner. Add in a few boxes of instant potatoes, some Vienna sausages and treat, and you have many different, simply made meals for quite a while. In this day and age of pandemic threats, this is probably not a bad idea at all. My question is where and how do you store all this? How do you keep the flour and such from going rancid or getting buggy? There's so much of it!